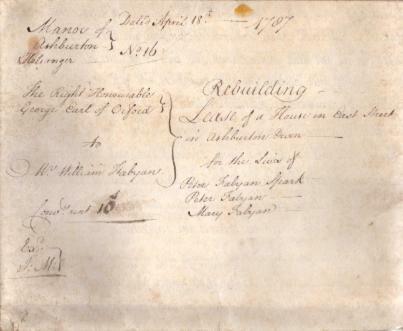 This is a lease on a house in East Street, dated 18th April 1787, held on a three-life lease. As the name suggests, this was a lease that ran until three named people had died - there was an upper limit of 99 years, and here the term 'fourscore years and nineteen' is stated. 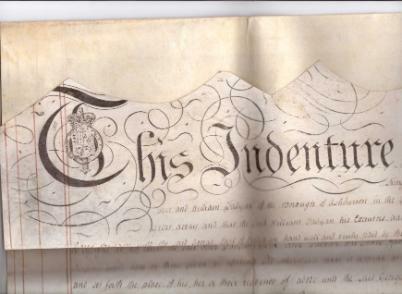 An additional condition is that William Fabyan and his heirs 'Shall and will perform and execute the office of Reeve for the said Manor of Ashburton when thereunto elected, appointed and required during the said term'. The owner of the house is the Right Honorable George, Earl of Oxford, and the tenant is Mr. William Fabyan, clothier. The property is part of the Manor of Halsanger within the Borough of Ashburton. It has East Street as its southern boundary, George Boynes's lands are to the west, and John Seale owns land to the east. It was lately in the possession of (blank) Jancock (?) but is now in the possession of William Fabyan. A condition of the lease is that William Fabyan must 'rebuild and repair' the premises, 'lately burnt down'. The lives named in the lease are: Peter Fabyan Spark, son of James Spark, aged about 13; Peter Fabyan aged 6 and Mary Fabyan aged nine, son and daughter of William Fabyan. The consideration is 5 shillings, and the rent is to be 10 shillings yearly, paid quarterly on the following traditional days: 24th June (Midsummer), 29th September (Michaelmas), 25th December (Christmas), and 25th March (Lady Day).